I spent a week in Jeddah, Saudi Arabia, for the grand opening of the King Abdullah University of Science and Technology. It was my first time in the Middle East. I hope it’s not my last. I was pretty ignorant of Saudi Arabia before I left. I never really studied the history of the Middle East in school, and my geography is so rusty that all I really knew was that it was next to the Red Sea. I visited WikiTravel and Wikipedia to get some introductory information, but didn’t really do more than that. Most of the information was reasonably accurate, so I didn’t feel completely uncomfortable there. 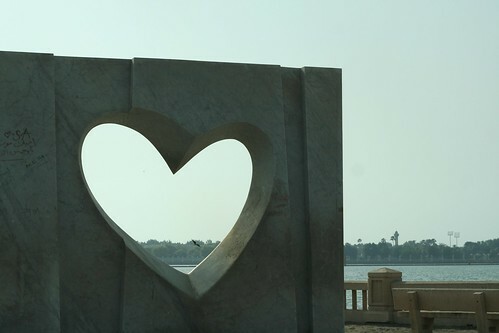 It goes without saying that Jeddah is hot. In the winter, it gets down to 32 C (almost 90 degrees Fahrenheit! ), and in the summer it gets up to 40 C (104 Fahrenheit), sometimes even higher. It was always sunny while I was there, and I’m told that there’s usually only two or three days of rainfall per year. Most of our activities occurred inside, so I most often experienced the heat were when I was walking to or from a taxi. As soon as you leave an air conditioned building, you are assaulted – literally – by heat. The abrupt temperature change caused a remarkable amount of condensation on my glasses every time I walked outside. This was also a problem for my cameras! I took a brief walk around my hotel, Le Meridien, on the first morning after I arrived. The sun was up, and hot, by mid-morning. I was the only pedestrian I saw, and the oppressive heat had me heading back to the hotel after only a couple of blocks. After cooling down inside, I walked across the street to the “super market” behind the hotel. This was, basically, a small-ish shopping mall that also contained a grocery store. Almost all of the shops were closed, with a few people mulling around inside. I learned that many of the shops were closed due to the Eid holiday. The shops don’t open until 4 or 5 PM. I never quite figured out if the shops closed specifically for the Eid, or if that was just coincidental. I heard several people indicate that the Saudis spend much of their day inside, resting or sleeping, during the late morning and early afternoon hours, and that everyday life didn’t really start until the sun went down. This made a lot of sense to me, but I didn’t get an opportunity to clarify it with anyone. I didn’t have a tremendous amount of free time, but I did manage to get to the souk (market) in al-Balad, or Old Jeddah, a couple of times, as well as drive along the Corniche (the name for the city’s beachfront). My overall impressions of the city are extremely positive. I was particularly impressed by all the small (and large!) statues that dotted the meridian between road lanes: there were a lot of statues, in a wild variety of styles and motifs, and it really created a unique feel for the city. I’ve not seen that much public art anywhere else, I don’t think. I got to go snorkeling in the Red Sea, and met the owner of the private, “foreigner friendly” beach we used. He gave me a free pass to come back any time. Unfortunately, I don’t expect that to be any time soon. The water along the beach was surprisingly warm – as in, really warm – but it cooled quite nicely when I reached the drop off into deep water. The water itself was gloriously blue, and visibility was terrific. There was a stunning amount of color to behold: corals, fish, and plants made it an almost dizzying experience. Most of my interactions with people within the Kingdom were controlled experiences. I was there as a journalist, and the PR firm that invited me did a terrific job ensuring that I had a good time there. Volunteers were stationed in our hotel to provide transportation and tourist assistance. These people were all very friendly, and I believe they sincerely wanted to make sure we had a good time in their country. As such, I think some of the answers they gave were a little myopic, as there was little motivation to discuss the less pleasant aspects of their homeland. 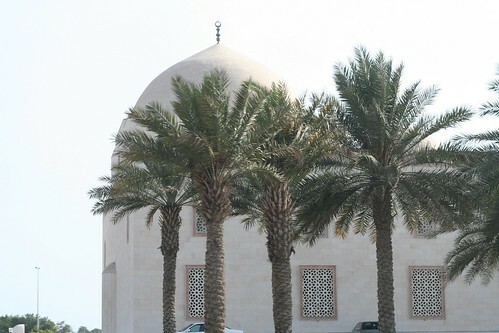 Jeddah is known as a fairly liberal city within the Kingdom. Islamic law rules the country, and women are supposed to wear an abaya (black overgarment) and head scarf to shield them from the prying eyes of men. In Jeddah, I saw many women forgoing the headscarfs. This is a fairly progressive thing to do, and not the kind of thing you’d see in more conservative cities like Riyadh. Women are not permitted to drive in Saudi Arabia, but several folks remarked to me that when they do, it’ll be in Jeddah first. As a tourist, I felt quite safe everywhere I went. I felt uncomfortable not being able to effectively communicate, but that happens just about everywhere I go. I didn’t worry too much about assault, or crime, and never felt threatened or unsafe. I’m not sure if the women journalists in our party would report the same feelings. To Western eyes, the culture toward women feels backward, almost barbaric, and oftentimes outright rude. It’s important for us to remember, though, that there’s a deep historical context to their attitudes and actions. We may not like it, but I think it’s important that we respect it, in the same ways we would want visitors to our country to respect our norms. On Friday night I had coffee, and then dinner, with a few Saudi readers of CrunchGear, and had the opportunity to speak a little more candidly about life, culture, and politics (in addition to technology and gadgets!). A lot of Western opinion about Saudi Arabia is based on mis-information and ignorance (as is so perfectly demonstrated in the comments on that CrunchGear post), so getting a chance to speak honestly about things was very illuminating. Not only was it illuminating for what I learned about the Kingdom, but also for what I learned about what the Saudis think of us! The image of the U.S. projected abroad is that there’s a gun in every house, and that gangs are on every street corner. All in all, I had a really wonderful time in Saudi Arabia. It’s not a place I ever expected I’d see, so it was a real treat to visit. I intend to get some books from the library to learn a little more about the region, and the Kingdom, so that I might be a better informed global citizen. If you ever get the opportunity to visit, I strongly encourage you to take it! You can see my photos of Jeddah, the Altayebat International City for Sciences and Knowledge museum, and the King Abdullah University of Science and Technology.